These days, Peer to Peer lending in India is growing at an astonishing pace. ?More and more people are becoming aware of p2p lending as a concept and are starting to prefer such platforms to take a loan. While there is a prodigious increase in the number of registrations on such platforms, banks are still the leading players in India. This is primarily due to their strong foothold in the country which has existed for many decades while P2P lending has only been around for a couple of years. While it?s continuing to expand, the P2P industry will still take time to make a large impact on the country. A lot of you will agree with me when I say ?As Indians, we tend to follow ideologies that are taught to us as children, even ones regarding finances, investments, etc. This is very true when it comes to taking loans. We are so accustomed to taking loans from banks or even loan shark, that the concept of a newer online platform is alien to us to an extent that we feel it?s unsafe?. Since the time of British Raj, zamindars were often the only source to borrow money. They were ruthless, charged high interest rates and were not merciful to the individuals who took money from them. It took decades for Indians to accept new ways of finance such as banks and just when we have started becoming accustomed to this, there has been a new revelation in finance: Financial Technology. This is the use of cutting edge technology to make financial decision making, investments and credit easier. A new concept has been introduced known as P2P lending, an alternative finance source. This concept has not been around for very long, especially in India which is why it?s very important to understand what peer to peer lending is before one starts lending or borrowing through the platform. It?s vital to be cautious when it comes to finance. 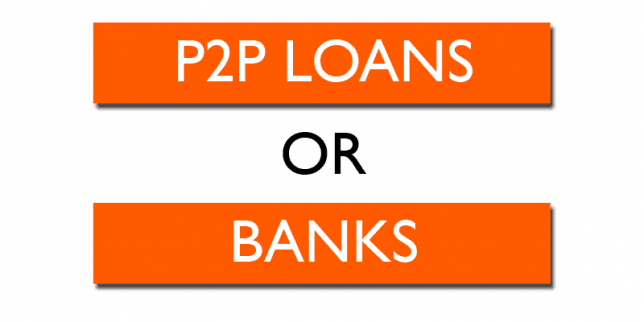 The question that arises here is ?Why should one choose p2p loans over loans provided by banks?? People in India think ?If I can get a loan at 11-13% from banks then why would I pay more?. This train of thought is absolutely rational but is it correctly placed? Do you really think that getting a loan from bank is cheap? The greatest problem is understanding the real cost of acquiring a loan from a bank. Apart from the personal loan interest rate, you have to pay for loan processing charges, prepayment fees, repayment mode swap charges, file handling charges etc. The gap between interest rate for depositors and loan rate is quite huge, approximately 20-25%! At the end, the cost of taking this loan is much higher as a result of these hidden fees! New P2P Lending platforms such as Rupaiya Exchange, Faircent, Lendbox now have the upper hand over traditional banking institute. There are no hidden fees. Many platforms such as Rupaiya Exchange do not even charge any prepayment fees. What they do is create a mutual relationship between individuals who require loan and lenders who want to lend their money for high returns. They create a win-win situation for both borrowers as well as lenders. For this, they charge a processing fee to borrowers. Other issues that individuals face when they apply for a loan from banks and how p2p lending platforms resolves them? Documentation Process: The documentation process that banks follow consumes a lot of time, sometimes more than a month whereas P2P lending is quick, easy and has simple processes. All you need to do is visit any p2p lending platform online, register yourself and upload the necessary documents for verification such as address proof, pan card number, ITR etc. You do not go physically as the complete process is online and hassle free. The faster you provide your personal data for verification, the faster your loan becomes live. Your loan can get easily funded within a span period of 2-20 days. Credit Score: One major factor which is considered by most banks before funding your loan is your credit score. If an individual has credit score less than 700 then his/her case would be a doubtful case for banks and chances of loan approval would be low while P2P lending platforms facilitate p2p loans even if you have a bad credit score because they consider other factors like online presence, social behaviour, financial history, etc. Low Cost: While there is a high cost associated with most credit options in the market, P2P platforms offer low cost credit options. This is due to the low operating costs of most P2P platforms. Most platforms only charge a processing fee to enable all transactions while traditional options require higher fees. These factors make Peer to Peer lending very exciting and more accessible to the public. India is a country of 1.25 billion citizens and we must have the right infrastructure to provide them with the support they require. Finances are required by all and providing a platform where it is next to impossible to get a loan isn?t going to help them. We need an efficient, transparent and secure platform which does that. This is what P2P Lending strives to achieve in India. Most individuals in India have not even heard of Peer to Peer Loans. Understanding the benefits of new processes and systems is very important to make our lives easier. Even if we don?t always take the newer option, one should always know what is available in the market. You never know what you might stumble across. Just make sure you always research and make a decision after studying pros and cons of all your options be it a bank, an NBFC or a Peer to peer platform. Always know where and how your money is flowing so you do not end up in unfavourable situations. First hand research is vital to make sure your money is safe. P2P Lending proves out to be very beneficial for Investing money. Like Mutual funds P2P Lending also offers asset diversification but return can be sometimes high or sometimes low in mutual funds whereas in p2p lending there is High returns on Investment from 12-36%. Some p2p lending platforms provide Loan Protection Fund also i.e. principal amount is secured which means the more safety for your funds and also an investor gets the monthly payouts. Some of the platforms are Rupaiya Exchange, Lendbox, Faircent and many more. For retirement planning, you should look at Equity Mutual Funds and not P2P. P2P is pure money lending business. Like any business, there can be high losses ! You covered various points in P2P. Good article Sanyam.